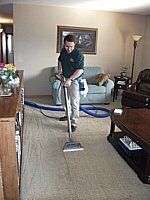 Success or failure for a carpet cleaner, at least from a technical sense, comes from his or her understanding of the Principles of Cleaning. The objective of cleaning is soil removal. Regardless of methodology, there are basic principles of professional textile cleaning which are common on every job. Pro Care Cleaning - Real Life Photos! The first principle in professional textile cleaning is dry soil removal. 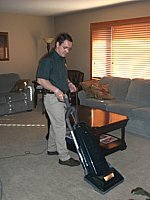 Careful, thorough vacuuming with a high filtration (HEPA) vacuum cleaner is the best choice to accomplish this. This should include edging, stairs and under furniture where practical. Vacuum performance, pile preparation and vacuuming procedures all play a role in the ulimate efficacy of dry soil removal efforts. The second principle in professional textile cleaning is soil suspension. This is the point where the professional cleaner suspends or separates ground-in or adhered soils that were not removed with vacuuming. Effective soil suspension is achieved utilizing four fundamentals: chemical action, heat, agitation and time (dwell time). 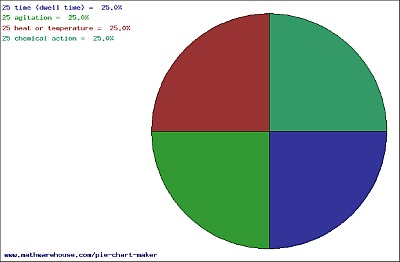 To the extent that you decrease one area of the pie, you must commensurately increase the other areas! Understanding this allows the professional cleaner to achieve acceptable results under a wide variety of situations. Detergents, builders and solvents are utilized to suspend, emulsify, peptize or saponify the various soluble or insoluble soils. Increasing temperature increases the rate of most chemical reactions, causing cleaning agents to function more efficiently. Agitation, mechanical or manual, provides for more uniform distribution of cleaning products. This enhances soil suspension in the carpet. Soil suspension is not instantaneous. Prolonged contact or dwell time is required for adequate fiber penetration and soil suspension to take place. The third principle in professional textile cleaning is extraction. Once soil suspension has been achieved to greatest extent possible the soils must be physically extracted. Methods of extraction include absorption, wet vacuuming, rinsing and dry vacuuming. The fourth principle in professional textile cleaning is pile setting or grooming. Grooming a carpet aids in evaporation, decreasing drying time and enhancing the carpet's final appearance. Grooming also assists in the uniform distribution of any post-cleaning applications, such as protector. The fifth and final principle in professional textile cleaning is drying. Freshly cleaned carpet should be dry in six to eight hours ideally. Dry times should never exceed twenty four hours. The professional cleaner should make every effort to expedite drying time, from use of the buildings HVAC system, to ceiling fans, to axial fans, etc.